Aaron Ye 7d has finally broken the glass ceiling at the World Youth Goe Championships (WYGC) by becoming the first American player to place in the top three at the event. Now in its 33rd year, the event has been run by the Ing Foundation for decades, and invites strong youth from all over the world to compete. Ye first attended the event in 2011, competing in the Jr. Division when he was just nine years old, and placing fourth overall. Calvin Sun, now 1P, also competed in the event for years as a child, and had also placed fourth when he was 13 (on his sixth attempt). China, Korea, Japan and Taiwan have shut everyone else out until this year, when Ye’s determination and effort finally paid off. Now 14, Ye has been at the top of the US youth go scene for years, winning the Redmond Cup several times, and putting up a strong fight in the AGA pro certification leagues, as well as dominating other youth events and leading in many AGA tournaments. The WYGC was held August 4th-7th in Tokyo this year, at the Nihon Kiin. Ye reached the semi-finals by edging out Takei Taishen 7D of Japan by a hairs-breadth 3rd tier tie breaker (SOSODOS). After losing to the tournament’s champion Jiang Qirun 2P of China, Ye went on to take 3rd place by defeating Ahn Dongjun 5D of Korea. The USA junior player, nine-year-old Matthew Cheng 2d faced a tough choice this year, as he also won the Redmond Cup qualifiers and could have had a free trip to the US Go Congress to compete at the finals. Unfortunately, the WYGC and the Congress were both held the same week this year, so Cheng had to choose one over the other. Cheng did well at the WYGC though, “placing 7th in an outstanding performance by a player who learned go from a you-tube video a scant three years ago,” said Team Leader Mike Bull. Cheng also managed to draw matches with three of the four strongest players in his division in his first three games of the tournament. -Paul Barchilon, EJ Youth Editor, with Mike Bull. 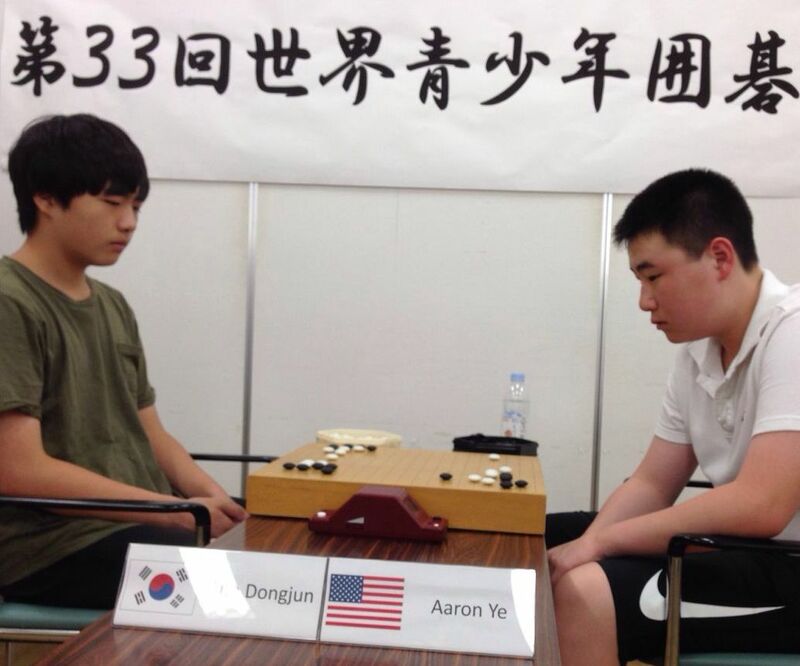 Photo by Abby Zhang: Ahn Dongjun 5d (l) vs. Aaron Ye 7d (r).